EV World has a weekly email update to which your editor subscribes. Because they provide a collection of articles and opinions from different sources, one often comes away questioning trends and even facts – or sometimes the meaning of it all. This week, an article referenced from Green Car Reports says that EV batteries may already have fallen to $250 per kilowatt hour. This would be a godsend for sales of battery-powered cars, because sticker prices would drop sharply. The article quotes Wolfgang Bernhart, a partner at Rolan Berger Strategy Consultants, that battery prices are already much lower than previous predictions would have indicated, possibly as low as $250 per kilowatt hour. His analysis credited economies of scale for this drop, which is based on 2015 demand. This paradoxical approach notes that battery manufacturers must begin planning production now for 2015 EVs, with prices quoted to those manufacturers based on that future demand. Such prices would be an optimistic five years ahead of their predicted 2020 levels. The number is based on anticipated sales figures for EVs three years out – predictive behavior always being a bit tricky. The $250 figure is for the battery cells only, and does not include casings, wiring and battery management modules. Tossing those things into the mix, which are reputed to add up to 20 percent to the cell’s cost, and facing today’s small production volumes causes batteries for the 2012 Ford Focus Electric to cost between $522 and $600 per kilowatt-hour. In a billion-dollar market, prices for lithium have tripled since 2000 and demand for the “conductive metal” is predicted to double by 2020. 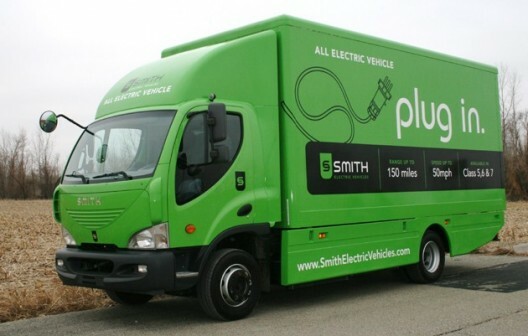 Smith's Newton Truck, likely to increase demand for batteries- but will rising lithium prices counter? Doubling global use of lithium from 2000 to 2011 and growing demand for Asian rechargeable lithum cells has helped prices rise threefold in that period. Although requiring much less of the metal for each unit, Apple’s iPad is projected to sell 107.4 million of their addictive electronic wonders this year. That international demand is challenged by the growing need for more batteries for vehicles, perhaps leading to the 52-percent rise in share prices for A123 systems on June 12, following the announcement of an improved lithium-ion cell that could cut costs of electric vehicles and offer improved performance in a wider temperature range than today’s cells. The blog will report on this new battery shortly. The company supplies batteries for GM, BMW, China’s SAIC Motor Corp., Daimler AG, Volvo AB, and Smith Electric Vehicles Corp., which makes delivery trucks. Large trucks require 20 times as many batteries per vehicle as even full electric cars, which will place huge manufacturing demands on battery companies and increased stress on the lithium market. Adaption of the more powerful lithium cells in place of older nickel-cadmium batteries is also driving demand. 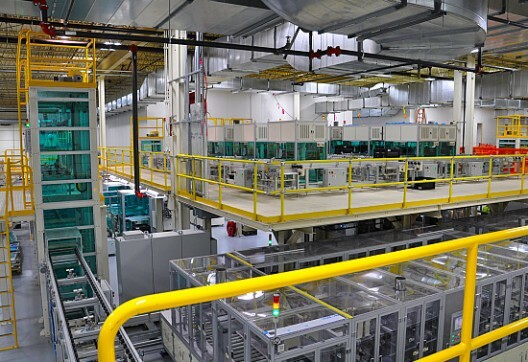 A123's Livonia, Michigan plant - large enough to reduce battery costs despite rising lithium prices? BusinessWire reports that Lux Research, a research consultancy which, “Provides strategic advice and on-going intelligence for emerging technologies”, lists three reasons for continuing high costs of batteries, which they see falling to no lower than $397 per kilowatt-hour by 2020. “Materials improvement and scale are insufficient to cut costs. While scale does have a significant impact in driving costs down, it is not likely to lead to a disruptive drop in battery pack costs unless coupled with other innovations. “Cathodes remain the biggest target. Cathode capacity and voltage improvement hold much more value than anode innovation. In the optimal case, with a maximum voltage increase of 1V and capacity increase of 200 [milliamp hours per gram], the nominal pack cost dropped 20%. These contending factors and competing analyses leave one unclear as to which directions the battery market and lithium futures are taking. Despite the uptick in A123’s stock price, one has to remember the extreme drop in stock prices the company has faced since its Initial Public Offering (IPO). With electric vehicles showing alternating signs of broader sales and market neglect, there is a listlessness in the market that will require a stronger trend to determine if there really will be a strong, ongoing demand, and if that will lead to greater production and lower costs for batteries. Or will speculation in lithium lead to volatility in pricing as has reputedly happened in oil futures? As suggested by BusinessWire, changes in technology and chemistries may make all these surmises moot.